If you’re drawn to the 2010 Honda Insight but love the Honda Fit better for its space-efficient package, you might want to wait another year; a Honda Fit Hybrid is on the way. Look beyond the appearance of the 2010 Honda Fit, which admittedly won’t quicken pulses. Honda nails the rest with the peppy, spacious, and frugal Fit. 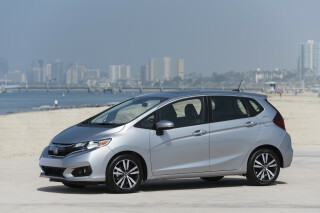 To put together a comprehensive full review covering the 2010 Honda Fit, TheCarConnection.com’s experts looked at what’s been said by a number of other critical voices. 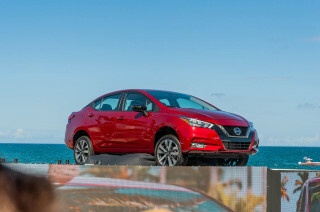 The editors of TheCarConnection.com also assembled an overall description of the Fit, along with driving impressions and comparisons to rival models, in this Bottom Line. The Honda Fit remains Honda’s most affordable model in the U.S. market. The Fit, which comes as only a five-door hatchback, was completely redesigned last year but remained about the same size. Although the 2010 Honda Fit is the smallest model in Honda’s lineup, it’s about the same length and width as the Honda Civic when it was last offered in the United States as a three-door hatchback (the 2000 model year). However, the five-door Fit is significantly roomier inside due to its tall, upright body style. To those who value style, the tall proportions arguably make it look like a scaled-down minivan in some respects, but also gives it an extremely roomy interior. What the Fit doesn’t have in silhouette it makes up for partly in the finer points; with last year’s redesign the Fit got a more aerodynamic, better-detailed look, with small side windows just ahead of the front doors to aid visibility, and a pair of character lines that run from the snout through the grille and hood. Inside, the rakish windshield leave a vast expanse of dashboard ahead of the driver, lending an airier feel than some other small cars. The swoopy, two-tiered instrument panel employs textured and matte-metallic plastic surfaces, along with upholstery and trim that are simple but sturdy. Overall, it's easy to conclude that the Fit has a higher-quality interior than some of its rivals. Space-efficient interior design is one of the Fit’s strengths; Honda actually allowed enough headroom and legroom for two adults—or three kids—in back, and the so-called Magic Seat folds flat by lifting a single lever and pushing the seatback forward, with no need to remove rear headrests in the process. The driving position affords a good view outward, and the steering wheel telescopes on all models. The cargo floor is especially low for easy loading, amassing an impressive 20.6 cubic feet of EPA cargo room. In addition, there are two glove compartments (upper and lower), plenty of cup holders, and many useful storage compartments and cubbies in the center console, dash, and doors. The 1.5-liter i-VTEC four-cylinder engine in the 2010 Honda Fit makes 117 horsepower, but that’s plenty to move the Fit quite quickly with the manual transmission and adequately with the automatic. 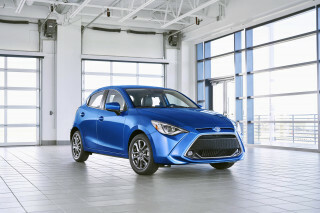 Fit Sports with the automatic get paddle shifters alongside the steering wheel to aid control on curvy roads, and fuel economy ratings are as high as 29 mpg city, 35 highway. Overall, Honda just gets it, achieving a very responsive, tossable feel that makes the Fit seem almost sports-car nimble yet also quiet and refined enough for an interstate trip. Parking and maneuverability are strengths, and despite the tall body and rather light weight, the Fit cruises confidently and relatively quietly at 80 mph. The 2010 Honda Fit is one of the best small cars for occupant protection, achieving five stars for front occupants in both frontal and side-impact tests from the federal government (four stars for side-impact and backseat passengers), and top good ratings from the Insurance Institute for Highway Safety (IIHS) across the board. It was the only "minicar," as the IIHS designates it, to be named a 2009 Top Safety Pick from the group. Although side airbags and side-curtain bags are standard, along with anti-lock brakes, electronic stability control is optional—oddly, it’s only offered with the navigation system. Two main models are offered: Fit and Fit Sport. Air conditioning; power windows, locks, and mirrors; and an MP3-compatible CD sound system are included with the base Fit. The Fit Sport gets larger 16-inch alloy wheels, cruise control, keyless entry, a security system, and USB connectivity for the sound system, along with sporty cues throughout. Offered only on Fit Sport models is a package adding the navigation system and electronic stability control. The 2010 Honda Fit makes a slightly awkward first impression, but its interior strikes the right look. It’s difficult to get the proportions right in a small, tall hatchback like the 2010 Honda Fit. Judging by the responses of a wide range of reviewers, Honda nailed the details, but the Fit’s overall effect can leave people hot or cold. 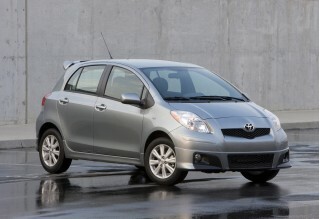 Reviews read by TheCarConnection.com show that most are less than impressed with the new styling on the 2010 Honda Fit. The Fit is "a subcompact four-door hatchback available in two trim levels: base and Sport," according to reviewers at Edmunds. Compared to the previous (2008) Honda Fit, Motor Trend finds that the latest model is "longer by 2.2 in., wider by 1.4 in.," and "longer in wheelbase by 2.0 in.," though it is still among the smaller cars on the road today. Jalopnik describes the revised Honda Fit as "more bulbous, less of a bullpup and more of a breadvan." Reviewers at Motor Trend point to a number of details, including “larger front quarter windows, larger, shapelier headlights, and sportier body-kit-like moldings." The interior of the 2010 Honda Fit fares consistently well with reviewers. Car and Driver thinks that the interior is much improved versus the previous version of the Fit, asserting that "Honda went for refinement...from a dynamic, interior, and styling standpoint." Jalopnik reviewers first notice the "abundant blue LEDs at important marks" on the instrument dials, but they lament the "poorly integrated but functional" navigation system. ConsumerGuide reviewers are impressed with the "high mounted, handy, and clearly marked" audio controls, as well as "rotary climate controls [that] are stacked to the right of the steering wheel and are easy to reach and use." 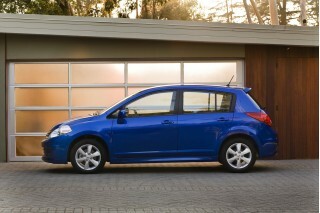 The 2010 Honda Fit is much more fun to drive than most other subcompacts, while returning very impressive fuel economy. Although the 2010 Honda Fit isn’t astonishingly fast, it’s clear from reading a multitude of reviews that it has a livelier, more enthusiastic driving feel than most other small, fuel-efficient cars. While reviewers aren’t bowled over, they’re quite impressed with the Fit’s handling and maneuverability, too. A 1.5-liter four-cylinder engine, making 117 horsepower, is the only one offered in the 2010 Honda Fit lineup. Honda's little four-cylinder is capable, but it has to move a bit more Honda Fit than before, and reviews read by TheCarConnection.com show that it doesn't offer quite as exciting a driving experience. ConsumerGuide notes that the Honda Fit is "adequate around town," but "highway passing takes patience." Jalopnik reviewers feel that the "adequetastic 1.5 liter" is "sufficient for its class." Motor Trend says the new engine offers "higher peak power and a much flatter torque curve," but Cars.com still finds that it delivers just "modest acceleration." Whether you go for the five-speed manual transmission or five-speed automatic, you’ll get impressive fuel economy. The EPA estimates that manual transmission Honda Fits and Honda Fit Sports with the automatic will get 27 mpg in the city and 33 mpg on the highway. The base Honda Fit with the five-speed automatic fares slightly better, with EPA estimates of 28 mpg city and 35 mpg on the highway. Overall, though, reviewers are much happier with the manual transmission, even though, Edmunds adds, "on Fit Sports the automatic comes with manual shift control via steering-wheel-mounted paddles." Cars.com notes that the standard automatic "isn't apt to kick down unless you give the pedal a good jab—even when in Sport mode," which leads Jalopnik to term the transmission "merely decent." The manual gets much more love, however, as ConsumerGuide claims that "Fit feels livelier with the manual," and Cars.com comments that it "is well-matched to the new engine's power band." Most reviewers note that the Honda Fit is quite enjoyable to drive and handles well. Edmunds calls the Honda Fit "highly maneuverable and a great urban runabout," but one Car and Driver reviewer notices himself "struggling to find that special something [he] used to love in flooring it, steering it, and halting it." On the positive side, Car and Driver praises the brakes, which "have lots of feel and never seem overwhelmed," and Cars.com mentions that "the electric power steering has decent feel." The 2010 Honda Fit has a versatile and cavernous interior that’s good for people and cargo alike. The 2010 Honda Fit might have you stepping back out of the car and doing a double-take; it really makes the most out of its compact exterior with impressive, usable passenger and cargo space. 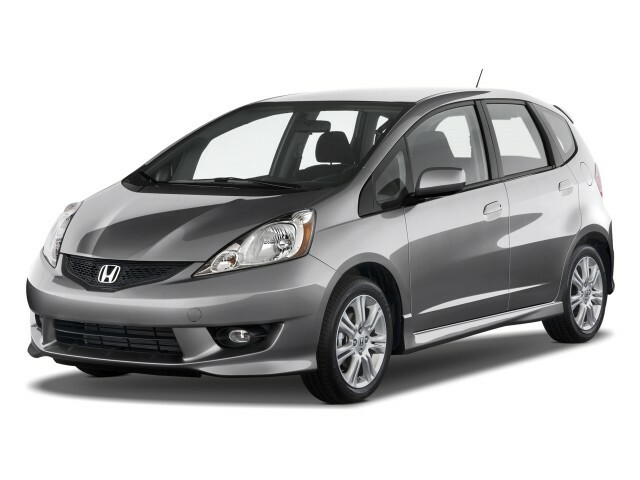 The 2010 Honda Fit has real space for four adults, with plenty of headroom and legroom in the backseat. Cars.com contends that the Honda Fit's "interior size belies its exterior dimensions," since "at 6 feet tall" reviewers there "had substantial headroom surplus, and legroom was good enough that [they] had to inch the driver's seat forward a bit to get full extension on the clutch pedal." Edmunds also notes that "taller drivers will be more comfortable," thanks to a "standard tilt-and-telescoping steering wheel [that] has made the driving position far more agreeable." ConsumerGuide finds that the front "seats themselves are comfortable," and are even more surprised by "how much rear seat room there is in such a small vehicle." ConsumerGuide claims that rear seat "headroom and legroom are more than adequate for adults, even with the front seats fully rearward." Edmunds agrees, declaring that "an extra inch of rear legroom makes it pretty hospitable in back, too." Though seating is surprisingly accommodating, cargo space—versatility, in particular—is where the 2010 Honda Fit excels. The so-called Magic Seat, Edmunds says "can be configured in a variety of ways" and allows for "the rear seatbacks [to] fold completely flat with just the pull of a lever." Edmunds elaborates that "if the rear seat is folded completely flat, the Fit can provide 57.3 cubic feet of cargo space," which is "considerably more than last year's 41.9 cubic feet." ConsumerGuide reports that "the rear seatbacks easily fold flat to provide a large, cubic storage area," while "the front seatback can be folded flat to accommodate long, narrow items." The cabin of the Honda Fit is brimming with space as well, and Jalopnik claims that the "nook-and-cranny factor has been expanded, with lots of little compartmentlets and even a small top-secret hidden stashbox under the rear seats." In addition, Jalopnik brags that the Honda Fit "will hold the hell out of your cups, with ten receptacles provided for that purpose alone." Reviewers almost unanimously agree that the 2010 Honda Fit has a better interior and more impressive fit and finish than other small cars. ConsumerGuide says that "nothing comes off as being cheap" inside the Honda Fit, and "the overall look is par for the subcompact course." Cars.com also praises the "generally high-quality interior" and "pretty upscale" look, especially on the Honda Fit Sport. The 2010 Honda Fit also offers a moderately well-insulated cabin. However, Cars.com reviewers note there is "significant engine noise when accelerating moderately to heavily." Furthermore, several reviewers praise the ride, including ConsumerGuide, which declares the new Honda Fit "commendably solid and reasonably compliant over bumps." The 2010 Honda Fit is almost certainly the safest car in its class; if stability control were standard, it would be a perfect 10. The 2010 Honda Fit is one of the best small cars for occupant protection, achieving five stars for front occupants in both frontal and side-impact tests from the federal government (four stars for side-impact and backseat passengers), and top "good" ratings from the Insurance Institute for Highway Safety (IIHS) across the board. 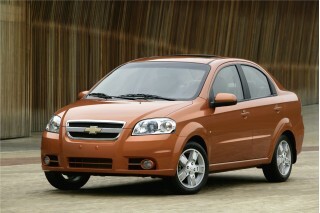 It was the only "minicar," as the IIHS designates it, to be named a 2009 Top Safety Pick from the group. In addition to a resilient body structure, the 2009 Honda Fit offers a list of safety features that rivals that of any other car in its class. Edmunds reviewers say that "standard safety equipment for the 2009 Honda Fit includes antilock disc brakes, front seat side airbags," and "full-length side-curtain airbags." ConsumerGuide adds that "front-seat active head restraints" and a "tire-pressure monitor" come standard on all Honda Fit models. Reviews read by TheCarConnection.com show that an electronic stability control system is also available. However, most reviewers, like those at Jalopnik, are disappointed to find that "the only way to get stability control" is to spring for "an optional navigation system." Outward visibility is much better in the Fit than in most other small cars, thanks to the nice, low beltline and extra front and rear quarter windows. ConsumerGuide notes the “rear headrests that retract flush with the tops of the seatbacks," and Jalopnik claims that "the Fit's outward visibility is amazing, obstructed laterally by only the narrowest of pillars." The 2010 Honda Fit comes well-equipped, and you’ll be happy, provided you aren’t looking for any leading-edge tech features. Those who like a reasonably well-equipped car will be pleased to see that the 2010 Honda Fit isn’t offered as a stripped-down special. The Fit costs more than most of its competitors, but shoppers likely won’t feel the need to add many options. Reviews read by TheCarConnection.com show that automotive experts are impressed by what Edmunds calls the "generous standard features list" on the 2009 Honda Fit. The base model of the Honda Fit includes just about all the features found on the Honda Fit Sport, including "air conditioning ... tilt/telescopic steering wheel," power accessories, and an "AM/FM/CD/MP3 player," according to ConsumerGuide. ConsumerGuide goes on to report that the Honda Fit Sport adds a "leather-wrapped steering wheel w/radio controls, cruise control," and "remote keyless entry" as standard features. 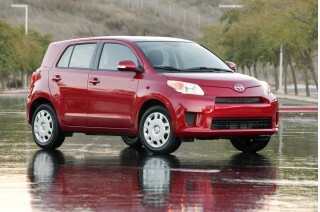 There are few options available on the 2010 Fit, and some tech options are sorely missing. Cars.com notes that "Honda's touch-screen navigation system and a USB port for accessing iPods and simple flash drives through the stereo" are the only available extras on the Honda Fit. This dearth of options disappoints some reviewers, especially those at Car and Driver, who confess that they are "surprised about the Fit's lack of available satellite radio and Bluetooth." This is my third Honda and I like it the Best!!! This Honda is a fun driving little car and you can go forever on a tank of gas. At 80mph it still is smooth and easy to handle. I would highly recommend this car. excellent trouble-free car for the price my only criticism is that the pedals are too close together. Looking for a different year of the Honda Fit?